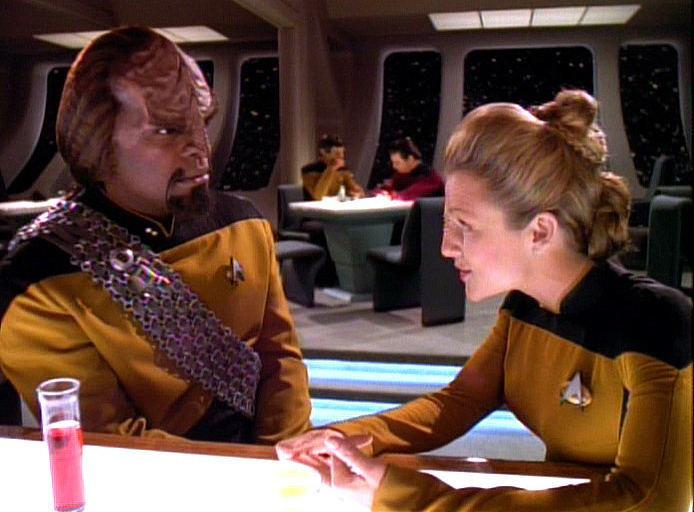 Worf mentors Ensign Sito in TNG’s “Lower Decks,” an episode that revealed that our characters actually are mentors to other characters rarely seen. Entering the slightly-past-halfway point of TNG‘s seventh season, “Lower Decks” is the proverbial diamond in the rough. It’s a really good diamond (one of seventh’s season’s best, and a TNG classic, for my money), but it’s within a stretch of episodes that are really, really rough. This stretch of episodes (if you start with “Homeward”) might perhaps cumulatively be TNG’s lowest point. When you have “Sub Rosa,” “Masks,” and “Genesis” all within five episodes of each other, you realize just how much TNG was starting to go over the cliff in its final season. I don’t believe it ever quite did — it had enough good to great episodes to make up for that, and of course we had that finale, which we’ll discuss soon enough — but after seeing both the highs and lows of TNG and seeing what the series was capable of, it’s hard not to be hugely disappointed in many efforts in its final season. This stretch of episodes contains some that are really quite un-good. But I must say that un-good episodes make for reviews that can be awfully fun to write. After this, we enter the home stretch (and I may live up to my hopes of finishing before year’s end after all) in the Fall of Season Seven — as well as the Seven Long Delayed Years of Jammer’s TNG Reviews. All the four big stinkers of Season One were part of a fourteen episode stretch, for what it’s worth. Also, nothing in TNG has the cumulative effect of the Voyager Trilogy of Terrors (although I defend Course:Oblivion). I have to count, but I believe the number of TNG episodes that have ratings under two stars is around thirty. (more than a full season!) Would you find this an acceptable number for modern television series in a similar 100+ episode run that need time to grow? Of all the episodes of in the home stretch that I’m looking forward of your review, is the penultimate episode, “Preemptive Strike”. “PS” is the Deep Space Nine-iest episode of TNG, outside of “Chain of Command”. I was at least entertained by “Masks,” “Genesis,” and even “Sub Rosa.” But by this point in the series, fatigue had definitely set in. (Well, since the start of Season 6, as I reckoned it.) Oh, Data as Frankenstein. Wow. Anything else to say, show? As much as TNG had become simply habitual viewing for me, the makers of the show were going through the motions, filming their contractually obligated episode order and running out the clock until the movie. Of the final 6 TNG episodes, 3 (maybe 4) were really subpar. Journey’s End, Bloodlines and Emergence were really poor episodes in my view. Firstborn was a strange one–where Worf’s future son travelled back to his past adolescent version of himself and kill his younger self. That’s s strange concept. Only sci-fi could do this, I suppose. Really the only great episodes here were Preemptive Strike and All Good Things… Preemptive Strike was a tragedy with Ro being torn between her loyalty to Picard and her desire not to betray her people in the Maquis to the Federation whom she supposedly serves. In the end, she experiences a crisis of conscience–a bit like Riker did in The Pegasus and things don’t turn out the way Picard imagines. The episode ends correctly on a sad forlorn tone too with Picard sitting all alone in the captain’s chair. The irony is its Patrick Stewart whose directing this episode of Star Trek. On Firstborn, I meant Worf’s son, Alexander, travelled back to the past adolescent version of himself to kill his younger self and change history. Perhaps, it was all Worf’s fault for pushing his son to lead the life of a warrior. Unfortunately, I still don’t like Firstborn sadly. It feels a tad clumsy overall. But yep, outside of several episodes here and there (‘Lower Decks,’ ‘Pegasus,’ ‘Parellels,’ ‘Preemptive Strike,’ and the finale), I always found this season to be rather weak. Not really relevant, but I’m not sure where else to ask: are you planning on reviewing the Blood & Chrome pilot? (I call it a pilot because that’s what it is, regardless of how it was split into 10 webisodes). I don’t think it’s as groundbraking as the BSG miniseries was, but still worth a watch, I’ll be curious to see the series if it ever gets made. As to the season 1 vs season 7 debate, I am solidly on the side of season 7 being the worst, and thus the worst season of the whole series. Season 1, although cluncky, and badly acted, and even worse written, is “perky” for lack of a better term. It IS fun. Some of the episodes are ridiculous, but at least they are trying, they are not even trying by season 7. I read somewhere that for the first few seasons Patrick Stewart said he just pretended he WAS doing Shakespeare while on set. I think it is obvious that by season 7 he was Patrick Stewart collecting a pay check. And he was the BEST actor. There was something just dull and aimless about the last season. There were moments in the 5th and 6th, but it really took over the series in the 7th season. There are episodes that I just start yawning if I see them on TV. As bad as the 1st season was, one is never bored watching it. At the end of the day we watch these shows for entertainment. We can pretend it is about higher moral values and future of humanity, but at the end of the day, we still have to be entertained. The 1st season was entertaining, the last was a long boring hike. “All Good Things…” for Auld Lang Syne? Interesting. I always had the opposite take on Season 7. I got the sense that the writers were trying to be more experimental with the episodes. The show did get a lot darker (for TNG standards) and there were a bunch of oddball episodes that really went where no Trek went before. “Masks” was stunning at least visually and in the new musical cues, but I agree it lacked some heart. Seeing the crew as animals in “Genesis” was, well, new. “Sub Rosa” was I think the first Victorian romance on the show and was an attempt to spotlight Dr. Crusher. “Pegasus” finally took the shine off one of the senior officers. “Lower Decks” went beyond the senior staff. Unfortunately, I think what ended up happening is that after 6 years of following a pretty reliable formula, the TNG staff didn’t know how to do Star Trek while incorporating new story genres. I kind of respect that the show at least tried to innovate, even if it failed. I have to disagree with you, Nick. I think Season 1 of TNG is not only the worst season of any Trek incarnation I have seen (I have not seen TOS’ third season or ENT), but probably the worst season of television I’ve sat through, period. The stories were unoriginal and/or boring, the writing was pedestrian at best, the actors were still settling in their roles, and the production values have remarkably dated. Even the best episode of the season “11001001” is nowhere near the greatness of “Lower Decks” or even “The Pegasus”. Season 7 was definitely not as good as Seasons 3-6 but it was better than the first two seasons. I don’t think Patrick Stewart was there just for the paycheque, he was still doing his best Watch “All Good Things…” and tell me that’s not one of Stewart’s best performances in TNG’s run. The series was definitely running out of gas, but never jumped the shark and made of for its lacklustre episodes with an incredible finale. I have to disagree with you. Season 1 of TNG is infinitely more re-watchable than the mind-numbing, uninspired staleness of any season of Star Trek Enterprise. Even in TNG’s awkward beginnings, there was an energy of effort and experimentation to see what worked and what didn’t. The show was 100 times more lively than Enterprise, which pretty much threw up its hands on day one, and cranked out unmemorable story after unmemorable story. (And don’t get me started on the pedestrian dialogue) Even TNG’s misfires like “The Last Outpost” or “Skin of Evil” have some campy entertainment value. I tried to watch the entire third season of Enterprise–ye gods! It was just like having my teeth cleaned. Everything I saw seemed like it was a rehash of a previous Modern Trek episode just reconstituted and repackaged like a hot dog. Back in 2001, I watched the first six episodes of ENT, then stopped. It wasn’t that I hated it — because that at least would’ve been *some* reaction even if it was a negative one — but it was because I thought it was so dull that I just didn’t care. I gave the series another chance in 2010 to see if I’d jumped the gun too quickly a decade earlier, so this time I watched it all the way through. I thought the vast majority of the episodes were either deathly dull, squarely neutral, or *mildly* interesting. In the fourth season, the “mildly interesting” would usually be paired with, “I can see how that would tie into TOS…” Overall, though, it’s mostly a flat line. I don’t have any burning urge to revisit it again in the future. TOS S3 and TNG S7 had a lot of out there ideas but at least they stood out. There may have been bad episodes but at least they were “so bad it’s good” or “guilty pleasure” type of episodes. And, for every “Spock’s Brain” there’s “The Enterprise Incident”. For every “Sub Rosa” there’s a “Lower Decks”. Somehow, it balances out. With TNG S1, again, it’s not a flat line. It gives you something to work with as a viewer. This upcoming stretch of reviews hopefully won’t be as painful for Jammer as the last several batches of episodes of season 7. I don’t think there are any “Sub Rosa” or “Genesis” level suckiness on the home stretch. “Journey’s End” isn’t as good as “The First Duty” by a damn sight, but it’s decent. “Firstborn” is a time travel story in the latter years of TNG that doesn’t devolve into technobabble. “Bloodlines” is a middling character piece. “Preemptive Strike” is a ‘TNG does DS9’ story and also outdoes all seven years of Voyager in terms of using the Maquis for dramatic storytelling. But, these are an amateur’s take. The J-Man has the final word here. I think our disagreement is a matter of degree, not substantial. I think S1 and S7 are both awefull. And we both tend to agree why. S1 has bad production, bad writing, overacting. S7 bad music, boring production, and underacting. At the end of the day I just prefer the over-acting and the cheese of S1 over the dullness, yet good produciton of S7. It is just more fun to watch, and a little closer to TOS, I might add. I will throw in there that I am very nostalgic for S1 TNG, and I freely admit that colors my judgement. I will EXTREMELY disagree with you on S2 TNG however, I will go as far as saying it is the 2nd best season of TNG. It doesn’t have the highs of S3 or the consistently good storytelling as S4, but I think the actual acting (as opposed to comfort of characters) was at its high here, and the better episodes were mostly home runs (Q-who, Measure of a Man, A matter of honor, etc..), in my opinion. I agree with Lord Gareth, Enterprise is basically the dull production of S7 TNG rolled out over a whole series. It is close to un-watchable. It was so formulaic by then. BTW, is Jammer still alive?? Well said. However, to me, TNG season 7 feels like VOY season 0 (or proto-Voyager) in a lot of ways. But, both were more watchable than Enterprise–a TV series that’s as grueling like getting your teeth cleaned–without the benefit of clean teeth.